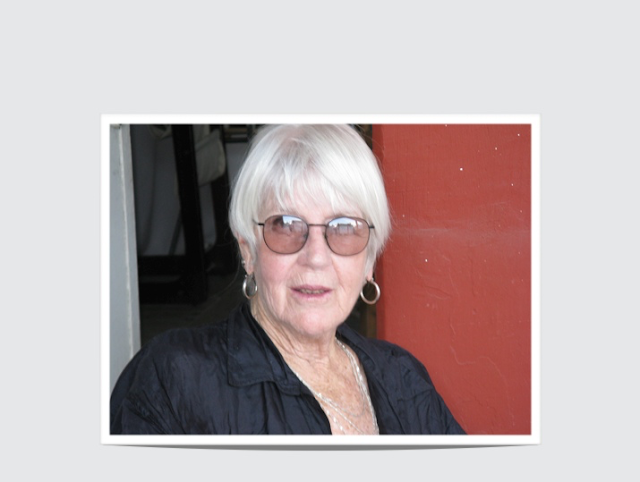 As my tenure as interviews editor at Queen Mob's Teahouse continues, the twenty-second interview is now online: Everyone Counts: Some Questions for Joanne Kyger, by Hailey Higdon. Other interviews from my tenure include: an interview with poet, curator and art critic Gil McElroy, conducted by Ottawa poet Roland Prevost, an interview with Toronto poet Jacqueline Valencia, conducted by Lyndsay Kirkham, an interview with Drew Shannon and Nathan Page, also conducted by Lyndsay Kirkham, an interview with Ann Tweedy conducted by Mary Kasimor, an interview with Katherine Osborne, conducted by Niina Pollari, an interview with Catch Business, conducted by Jon-Michael Frank, a conversation between Vanesa Pacheco and T.A. Noonan, "On Translation and Erasure," existing as an extension of Jessica Smith's The Women in Visual Poetry: The Bechdel Test, produced via Essay Press, Five questions for Sara Uribe and John Pluecker about Antígona González by David Buuck (translated by John Pluecker),"overflow: poetry, performance, technology, ancestry": kaie kellough in correspondence with Eric Schmaltz, and Mary Kasimor's interview with George Farrah, Brad Casey interviewed byEmilie Lafleur, David Buuck interviews John Chávez about Angels of the Americlypse: An Anthology of New Latin@ Writing and an interview with Abraham Adams by Ben Fama, Tender and Tough: Letters as Questions as Letters: Cheena Marie Lo, Tessa Micaela and Brittany Billmeyer-Finn, Kristjana Gunnars’ interview with Thistledown Press author Anne Campbell and Timothy Dyke’s interview with Hawai’i poet Jaimie Gusman. 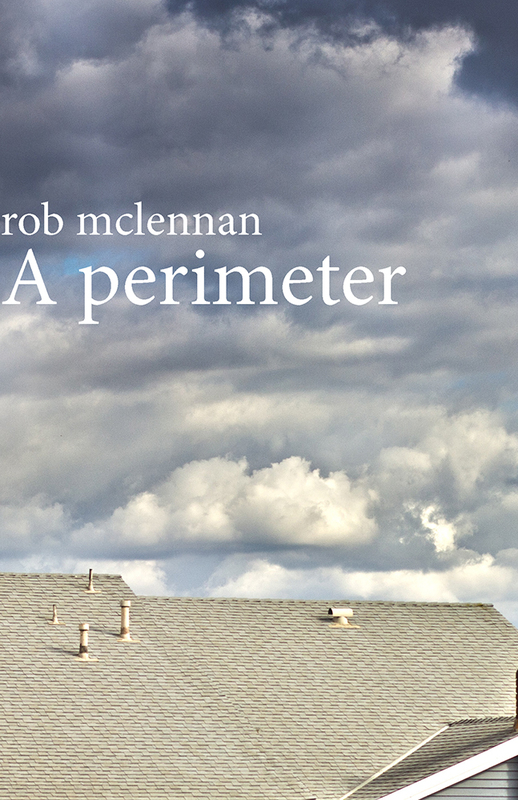 rob mclennan’s A perimeter (New Star, 70 pages, $18) details the struggles of a poet "Caught, between ambition and exhaustion" — in other words, one that is also a dad. Through fragments that mimic both the fragmentary thought processes of the new father and the tiny slivers of time he can now dedicate to writing, mclennan’s poems crash fragment against fragment in an elegy for "u((n)in)t(e)rr((u)pte)d) s(l))ee)p."
The title poem considers the "property boundary" and the lawn as a place through which to think about identity, a father’s role, and where the personal and public intersect. 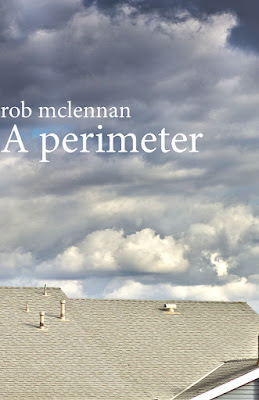 One of the prolific mclennan’s stronger books. Wake by 6am. Put the kettle on for toddler’s oatmeal, start coffee. Slip into the washroom, splash my face with water. Quickly dress. Kettle boils. Slip a bowl of oatmeal in front of eager toddler, check email, collect my newspaper from the front step. Coffee. A second bowl of oatmeal. Wife prepares herself for work, checks her phone, dresses, puts on makeup, interacts with now-fed toddler. I read my newspaper. She heads out to work. Gather toddler, change and dress him, offer his snow pants to begin the process of heading out. He dresses, slowly, allowing for another sip of coffee. I make a quick stop in the washroom, and brush teeth. Collect keys, adjust his snowsuit and boots. Collect his schoolbag and own coat, boots, before out the door by 8:45. This will be a good day. This will be a good day. Nisha Bhakoo’s writing has been published in numerous literary magazines, and her poetry has been included in anthologies by The Emma Press and Mud Press. In 2015, she was shortlisted for Cambridge University’s Jane Martin Poetry Prize, and was awarded 3rd Prize in the Ledbury Festival Poetry Competition. She has showcased a selection of her poems at BAFTA, and had a two-week exhibition of her writing and poetry films at Rich Mix, London. She was also selected for GlogauAIR Artist Residency in Berlin in 2015. 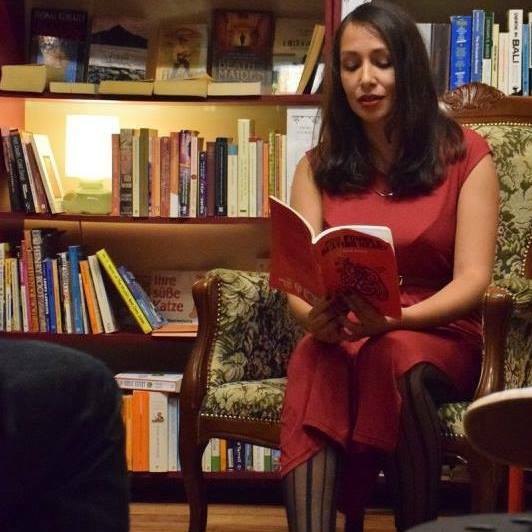 Her debut poetry collection, You found a beating heart, was published by The Onslaught Press in 2016. Relief! A lot of the poems in You found a beating heart were written when I was in a pretty dark place, and although the process of writing them was very therapeutic, I felt a huge sense of relief when the book was published. I felt like I could start a fresh. I definitely see a change in the poems I’m writing now – they are less raw and more controlled, although they still have the same dreamy, uncanny and gothic qualities to them. I have always scribbled down my thoughts, feelings or just strange phrases on paper since I was a teenager. I was obsessed with song lyrics when I was younger, not just the music, the lyrics were of equal importance to me. It was at around 15 that I started to look for poetry outside of the classroom. I can write poems very quickly. Some poems come to me in a matter of minutes, and I rarely change poems after a few days of writing the first draft. I feel like I should stay loyal to the particular headspace I was in when I wrote the poem. Even though they come quickly, the process of putting together a collection is quite slow. It takes time to put together a manuscript of poems that you want to publish. A lot of poems get discarded along the way. Also, I am writing a novel now and even though I finished the first draft very quickly, I know the whole publishing process is going to be painfully slow. Many people don’t realize the length of time it takes to edit a piece, find an agent, edit again, then a publisher, then start the whole editing process once again. It can take years and years until the book is finally published. I am always working towards a book, but I am aware that not every poem I write will end up being in the final manuscript. I think it’s important not to force things, the more you force, the harder it gets. My work is very personal and quite exposing but I try to agree to every reading I am offered because I think it’s an important thing to do, and even more so because it takes me out of my comfort zone. I also find that poems are so much more powerful when read by the poet, just the act of reading a poem out loud can change the tone or meaning of the poem. I don’t think I’m trying to find answers in my poems, it’s more that I’m trying to work through certain feelings or processes, for example, grief. Nearly all of my poems are based on my own personal experiences. I am very opinionated but I don’t have to write poems that are centred on these opinions. I think you can ruin a poem if you come to it with a carefully plotted agenda, it can take all the humanness out of it. I think that when you write a poem, your beliefs and values creep into them naturally. For example, I don’t set out to write feminist poems, but because I am a feminist, feminist values are going to be present in my work, even if it’s in a subtle way. You don’t have to hit people over their head with your politics, and just because you come from a minority group, it doesn’t mean that all your poems should be about one particular aspect of your identity. It’s very reductionist, and a bit offensive when people suggest that. The person you are will come through in your work, even if you are writing a poem about a flower! I think the writer’s job is to write honestly about life, even if you are writing fantasy, you can still bring real emotion or atmosphere to it. Writers should expose the parts of themselves that are often kept hidden, because if a poet is dishonest and submits to the status quo, what hope do we have? Of course not everybody is going to like your work, and of course you will upset people, but that’s all part of being a writer, you have to be rebellious. I’m really interested in receiving constructive feedback. I have an on-going poetry exchange with another poet, and her feedback has improved my work considerably. I don’t think an outside editor is essential, but it is advisable. There is no writer’s lifestyle. Don’t wait to be told what to do, just write! 10 - How easy has it been for you to move between genres (poetry on the page to poetry films)? What do you see as the appeal? The challenge of finding visuals for my poems is so exciting! Making poetry films and working as a director has been quite an experience, although it’s not always easy. Once I’m set on an idea, I know exactly what I want, and am very focused on bringing it to fruition, however films don’t ever turn out entirely how you expect them to, but in my experience, this hasn’t ever been a bad thing. I am interested in literature, visual art and film, so it made sense to combine these interests. As with most writers, there is no such thing as a typical day. I squeeze in as much writing as I can whenever I have a spare few hours. I have commitments outside of writing because I have to pay rent! But writing will always remain my priority, even if it means sacrificing a comfortable life. I am lucky because I haven’t ever experienced writer’s block. I seem to have the opposite problem. I have hundreds of ideas at any one time, and take on multiple projects. I am getting way better at saying “no” though. There are multiple places that I consider to be home, so this is an impossible question to answer, I’m afraid! All of the above. My poems come from everything that surrounds me. A lot of my poems are closely connected to nature. I have a whole section of water poems in my debut collection You found a beating heart. I read quite diversely, and listen to book podcasts and youtube reviews regularly. I like to expose myself to lots of different types of writing, because I think it’s important to know what else is out there. I think the poet that has had the most impact on my work is Thom Gunn. I wrote my MA thesis on his work. I would like to complete my novel. I’m taking a break at the moment to concentrate on other projects. Definitely something related to the arts, perhaps a painter. It’s something I have to do, it’s a coping mechanism for me, and it’s the only activity I can fully lose myself in. It wasn’t really a choice. I am enjoying reading Dream Story by Arthur Schnitzler at the moment – this was the book Kubrick’s film Eyes Wide Shut was based on. I would choose Perdues dans NewYork for the last film I really enjoyed. It’s a strange, poetic film, which is quite similar to a lot of my work thematically. I want to return to academia soon to do a PhD related to poetry and film, so I am just considering my options at the moment. I am also really excited about finishing my novel. 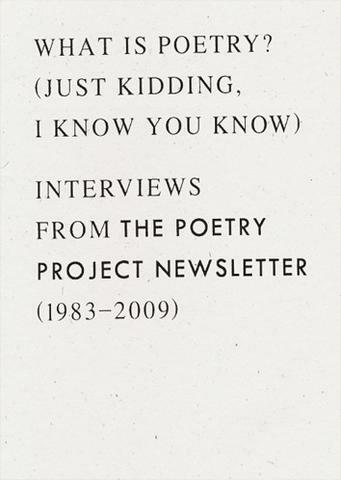 As Berrigan writes, the interviews collected in this volume were originally done for publication in The Poetry Project Newsletter, with a collected thirty-eight interviews that range in dates from 1983 to 2010, conducted with poets (some who are included here more than once) including Red Grooms, Paul Schmidt, Bernadette Mayer, Allen Ginsberg and Kenneth Koch, Harryette Mullen, Alice Notley, Ed Sanders, Samuel R. Delany, Renee Gladman, Fred Moten, Stan Brakhage, Larry Fagin, Tina Darragh, Edwin Torres, Brenda Coultas, Will Alexander, Ron Padgett, Ted Greenwald, Eileen Myles and Bruce Andrews and Sally Silvers. As fascinating as the interviews are in the collection, editor Berrigan presents a whole array of information and insights on The Poetry Project in his introduction, including the suggestion that perhaps a proper history of their five decades-plus might be worth someone finally putting together. There are ways in which the interviews, collected here as they are, do present a portrait of the ongoing activity and environment of The Poetry Project, one that comes with friendships, apprenticeships, arguments and pitched battles, all while attempting to do the work of writing and continue a writing life. This is an enormous volume, and one that should already be seen as enormously valuable in terms of both history and craft, and showcasing the value of The Poetry Project itself, for hosting, assisting and developing a wide array of writing and writers. And, if nothing else, this volume should point readers into understanding just how important it might be to start reading the contemporary issues of The Poetry Project Newsletter, to keep up with what else is happening. Lisa Jarnot: I want to talk to you about Allen Ginsberg. Partly, what was your relationship with Allen like? The book does make me wonder if it might be worth putting some of the other interviews online, a la The Paris Review, for the sake of a wider readership and even scholarship. Given there are more than two hundred interviews (at least) to date, what else is out there worth reading?